I've updated The LFC Goal Machine to include season 2016-17. You can play with the lfcgm app at lfcgm.lfcsorted.com. 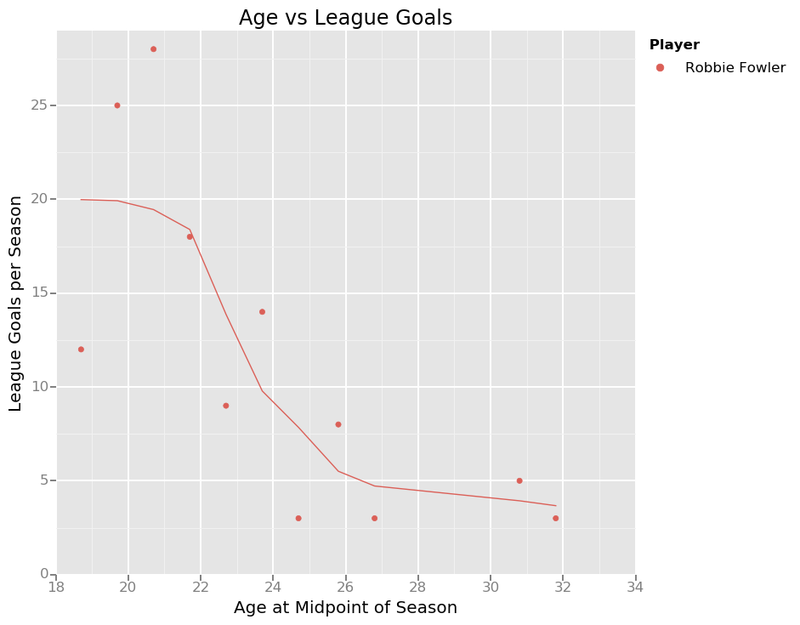 The LFC Goal Machine is a simple web app that plots a player's age against the league goals that the player scored in a top level season. The app knows about every LFC player who scored a top level league goal in more than one season, from 1894-95 to 2016-17. You can use the app to compare players across different seasons and eras. Simply select one or more players and take a look at their graph. For more information see my earlier blogpost: The LFC Goal Machine - Graphic Detail. I've updated The LFC Goal Machine to include season 2015-16. You can play with the lfcgm app at lfcgm.lfcsorted.com. The LFC Goal Machine is a simple web app that plots a player's age against the league goals that the player scored in a top level season. The app knows about every LFC player who scored a top level league goal in more than one season, from 1894-95 to 2015-16. You can use the app to compare players across different seasons and eras. Simply select one or more players and take a look at their graph. The animated map shows how the world was painted red from Liverpool's first season in 1892 to the most recent season that ended in 2016. A country is painted red on the world map when a player who was born in that country appeared in the Liverpool squad for the first time. At the end of season 1976-77, the season when Liverpool won their first European cup, only 7 countries had been painted red: England, Scotland, Wales, South Africa, Northern Ireland, Ireland, and USA. At the end of season 2015-16, 44 countries had been painted red. 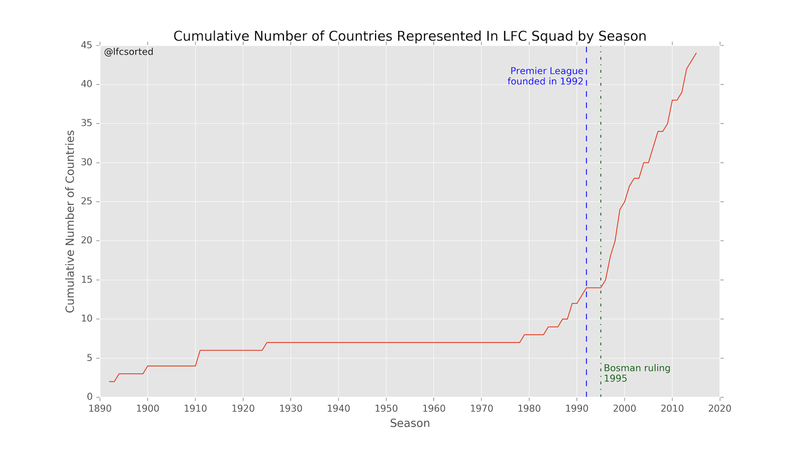 This is a remarkable increase, illustrating the globalisation of LFC and football. The graph below describes that growth. Every Liverpool fan knows that Liverpool Football Club has a strong connection with Scotland. Bill Shankly forged the modern Liverpool and Kenny Dalglish was probably Liverpool's greatest player. Liverpool's most successful period during the 1960s, 70s and 80s (when 13 titles were won) was shaped by Scots. But this Scottish influence goes way back, to Liverpool's first season. Liverpool were literally made in Scotland. It is unlikely that Liverpool would have won their first league title in 1900-01 without the Scottish contingent. In my article about Liverpool's creation I described the situation in 1892 following an almighty bust up with Everton where John Houlding, Liverpool's founder, was left with the Anfield stadium and no team to play in it! John McKenna travelled to Scotland to find talented players for the new Liverpool team. Heading north in search of players wasn't a radical new approach. Preston North End's 'invincibles' had won the first ever league title in 1888 with several Scots in the team. In 1892 Scotland didn't have a professional football league but it did have many skilful footballers with limited job opportunities. And Liverpool FC had an ambitious owner who was determined to build a team that would challenge for the title. It isn't a surprise that so many Scots took up McKenna's job offer. 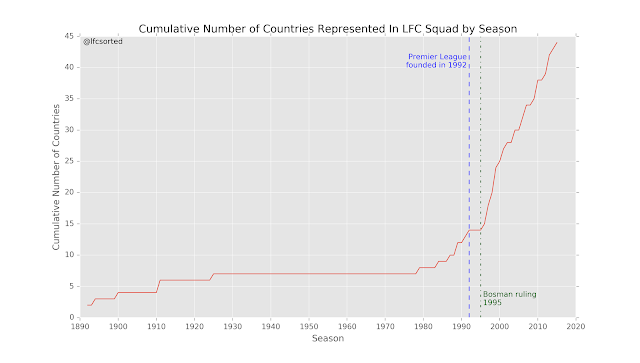 The graph below shows the number of Liverpool squad players, with their country of birth, from 1892 to 1907. Liverpool won their first 2 league titles during this period, with Tom Watson as manager. 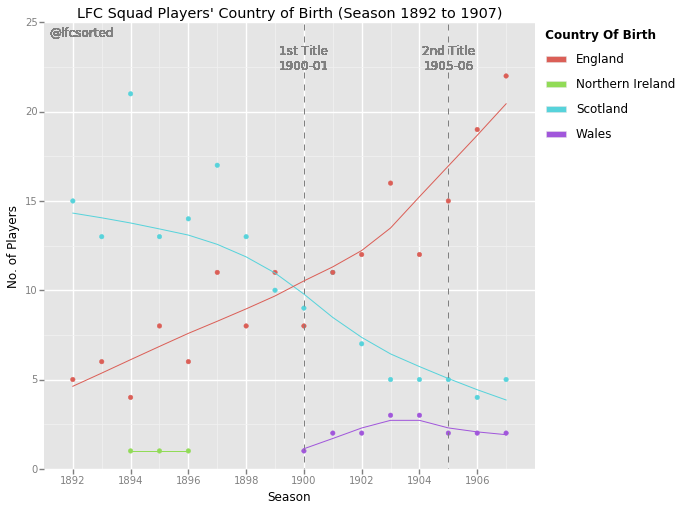 The coloured dots show the number of players in the squad in each season for a particular country. For example, the blue dots show the number of Scots in the squad in each season. And the blue line shows the trend in the Scottish player numbers over the seasons. In their first season in 1892-93 Liverpool's squad was 75% Scottish. In the away match against Blackpool, 9 of Liverpool's starting 11 were Scottish, the match was billed as 'Lancashire against Scotland'. Liverpool were known as the 'team of Macs'. 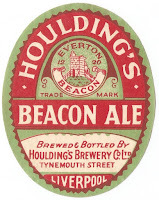 John Houlding's split with Everton FC had been acrimonious. The coup de grass - if you'll excuse the Anfield pun - had taken place 3 days earlier on 12th March 1892 in a packed Sandon Hotel, the club's headquarters and match-day dressing rooms. George Mahon, his bitter rival on the Everton board, had announced that Houlding's services as club president and Anfield landlord were no longer required. Mahon said that Everton were not prepared to pay Houlding's increased Anfield rent and were moving across Stanley Park to a new ground at Goodison Road. Mahon was literally taking away his ball, the team and the supporters. 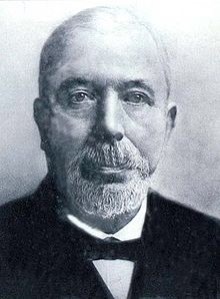 Houlding, the Anfield owner, was left with a good pitch, a decent stand, a hefty loan and no football team. When Mahon said he'd be back to dismantle Anfield's wooden stand and move it to the new ground at Goodison, Houlding had lost his cool and thrown him out the Sandon. 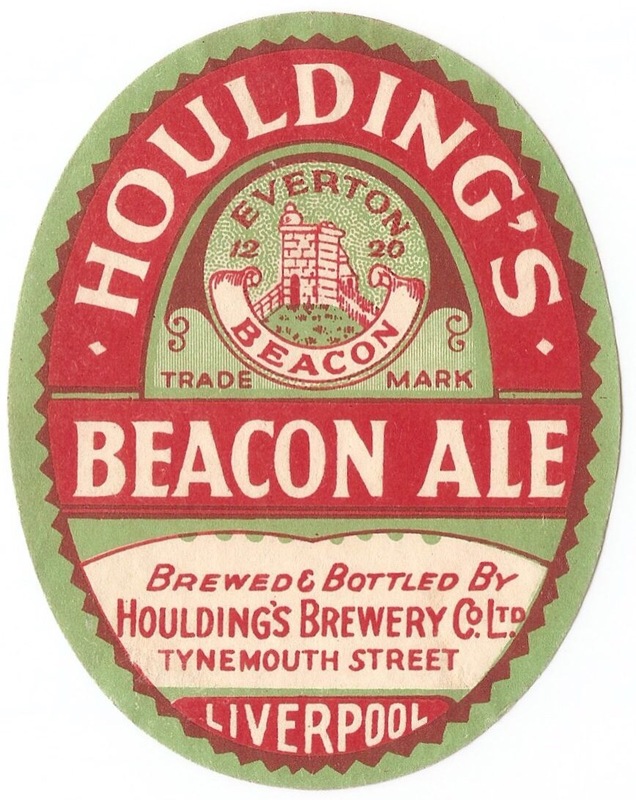 Well, this was his right as he also owned the pub and the Houlding's Brewery Company that supplied its fine sparkling ales! I've developed a simple web app called The LFC Goal Machine that plots a player's age against the league goals that the player scored in a top level season. The app knows about every LFC player who scored a top level league goal in more than one season, from 1894-95 to 2014-15. You can use the app to compare players across different seasons and eras. Simply select one or more players and take a look at their graph. You can play with the lfcgm app at lfcgm.lfcsorted.com. To whet your appetite I've selected some graphs from the app that I found interesting. I've been watching Liverpool since the early 1970s. The graphs show players from before my time, such as the record-breaking Gordon Hodgson who was born in South Africa in 1904. The app's data is sourced from lfchistory.net and you can find out more about the players listed at www.lfchistory.net/players. Robbie Fowler is the only player in Liverpool's illustrious history to score 20 or more top level league goals when under 20 years old. In his first three seasons Robbie scored at one of the fastest ever rates, scoring 12, 25 and 28 goals.